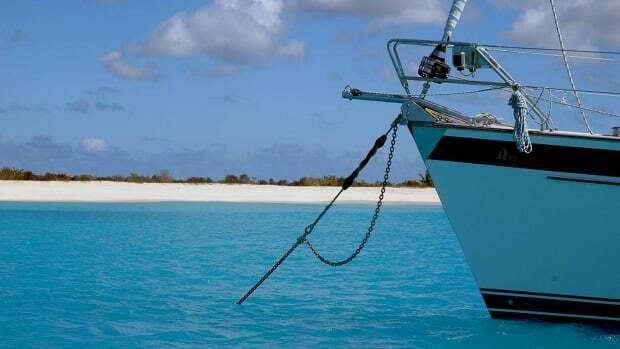 In The Complete Book of Anchoring and Mooring, Earl Hinz explains the difference between anchoring and mooring: A boat is anchored when "it rides or lays to a single anchor rode, although it is conceivable to have two anchors in tandem on the rode." A boat is moored "after it picks up a mooring buoy or has set a multiple-anchor moor of its own." When reading about it, anchoring seems like such a simple activity: stop the boat, lower the anchor, back off a short distance, set the anchor, deploy adequate scope, install a snubber, secure the rode, and finally, to announce your success, rig an anchor ball or hang the anchor light. Simple enough, right? But if this is the way to do it, why so often do boats break loose or drag? If you were thinking that there must be more to it, you would be right. 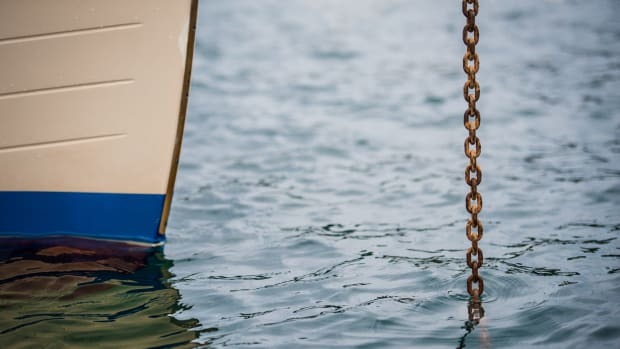 Anchors do not function alone, in fact they require a significant number of other components: chain, rope, bow rollers, chain stopper, windlass, cleats, maybe a samson post or a pair of bitts. Don&apos;t forget the shackles, splices, knots, swivels, snubbers, anti-chafe materials, safety wire, rode markers, buoys, trip lines, whipping thread, kellets-jeez, the list seems endless. Then, if this wasn&apos;t enough, not only must all this be compatible with the bottom conditions, but also able to withstand whatever Mother Nature blows at the boat. So, it isn&apos;t just an anchor, it&apos;s a multi-part system where not only must each component not fail, but they also must be able to interact with and rely on each other. So there it is... a seemingly simple activity that is successful only as long as all of the myriad of details exceed the minimum required of them under the conditions. This brings us to what we consider the most important part of anchoring-the knowledge to choose gear that is more than adequate for the circumstances, and the motivation to employ it prudently. Over the years we have noticed that the crews on boats that do not drag, especially during harsh weather, view anchoring differently from those that do. One interesting aspect that we notice about their boats, and the bigger the boat the more applicable it seems to be, is their choice of ground tackle. It is usually hefty, plentiful, able to be "mixed and matched," and most important of all, every part of it is capable of exceeding that which Mother Nature may demand of it. Another thing that attracts our attention is the crew&apos;s approach. If per chance the anchor drags, the crew first looks to the "big three": the anchor&apos;s size, the anchor&apos;s design, and the amount of scope deployed. Odds are that it will be one of these factors that was at fault; not the bottom. But, if the boat broke loose, then a component failed and whatever failed just wasn&apos;t hefty enough to do the job. It&apos;s that simple and it is a mistake that shouldn&apos;t be made a second time. There is one caveat to anchoring that is often overlooked, or maybe it is just unknown-recommendations given for anchors or anchoring are usually, if not always, minimum requirements... starting points, not stopping points. Unless there is a specific reason not to, and since there is seldom any harm in exceeding the recommendation, often much good can come from doing so. On the contrary, fall short, whether it was intentional or not, and successful anchoring will likely prove to be elusive. 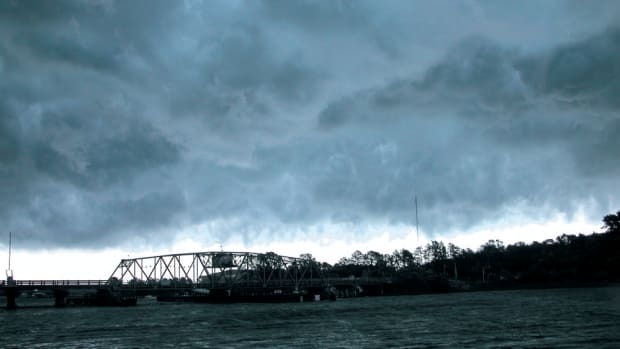 We often hear the phrase "in an emergency, anything is better than nothing" being applied to squalls, gales, storms, and hurricanes. But in our book, these natural phenomena are not emergencies. Since they are expected to occur, and do, they should be taken into account when sizing and deploying something as important as ground tackle. If that is done, and done in a manner that is more than adequate for the conditions, excuses would not be necessary. On the other hand, it is not necessary to try to achieve perfection. As knowledge and experience are gained it will be seen that quite often for a particular set of circumstances, maybe every time, there is not necessarily just one way to anchor; in fact there may be several alternatives, any of which would work. And here is another important consideration-anchor size, anchor design, scope, strength of the components, and anti-chafe gear each perform specific functions; functions that differ from, and are not interchangeable with one another. To substitute one to do the job of another will only increase, at times significantly, the odds that the anchor will drag or trip and so should not be done unless considerable knowledgeable thought went into the decision. Often the gear required to anchor successfully, particularly in heavy conditions, is of such size that few chandleries carry it in stock; therefore it takes time to order it in. In addition, whenever heavy weather is forecast, particularly hurricanes, the shelves usually empty quickly. So to avoid having to be left with excuses, determine what is needed, then get it on board, organize it and practice with it so that problems and deficiencies can be eliminated, and do it all early. In fact, getting the storm gear on board before the boat is even launched is the most prudent way to go. So, when it comes to anchoring and the wind or seas are getting up, bigger is better than smaller, stronger is better than weaker, longer is better than shorter, heavier is better than lighter, and doing it sooner is better than later-at least this is our opinion.